At college in Chicago in 1977, Anna meets the handsome and charming Nouri. Nouri is Iranian, worried about the future of his country. Many students – Nouri included – are protesting the Shah, although even in America they must be wary of the Shah and SAVAK. Despite the turmoil, Nouri is looking forward to returning to his home country after graduation, and he wants to take Anna with him as his wife. At first their life together in Iran is good, lubricated by the wealth accumulated by Nouri’s father and the family’s social standing. They have arrived in Iran at a turbulent time, however, and before long being American becomes a liability for Anna, and being married to an American becomes a liability for Nouri. As the stability of the country starts to disintigrate, so does Nouri and Anna’s marriage, until finally she is accused of his murder. A Bitter Veil takes a unique look at the Iranian Revolution. Anna is particularly vulnerable in Iran in this period, because she has no support system beyond that of her husband’s family and when he turns against her there is not much that they can do. It is very easy for an American reader to relate to Anna, there is a good deal of tension, as readers know what is coming in Iran, with the Ayatollah coming into power. 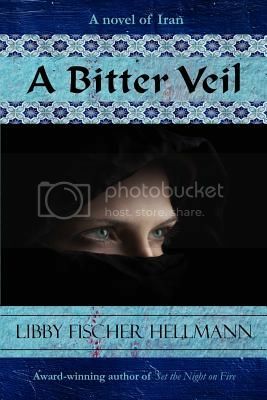 There are times early on when the writing of A Bitter Veil is ever so slightly uneven, but Hellman soon settles into a rhythm, and the story she is telling draws the reader in enough that they will not notice any further unevenness. Not my usual type of book, but this sounds fancinating. There’s a hint of crime/mystery here too, so it isn’t a COMPLETE departure, but it definitely isn’t something I would classify as a crime novel.